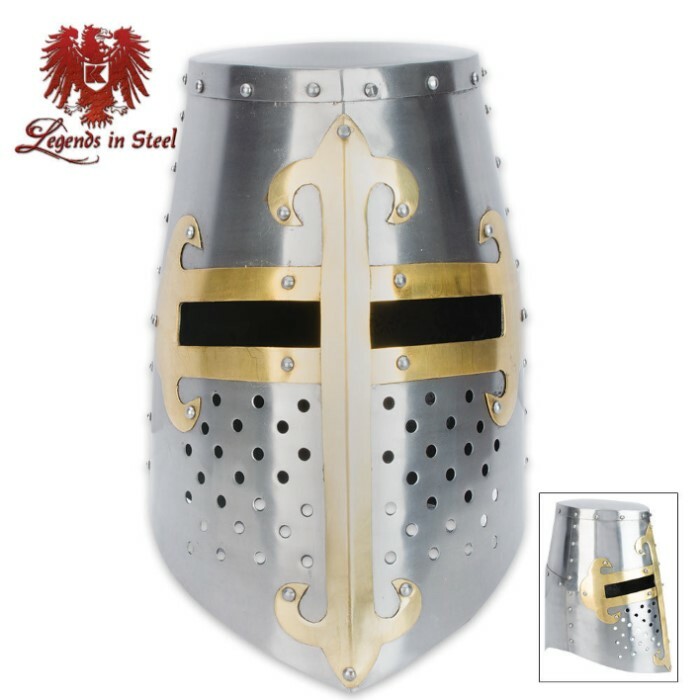 Crusader Helmet with Brass Fittings | BUDK.com - Knives & Swords At The Lowest Prices! Reproduction of classic Middle Ages "Great Helm"
The "Great Helm" offered its user excellent protection and its numerous holes provided breathability. Our reproduction helmet flawless mirrors this iconic Middle Ages military headgear. Constructed of heavy gauge carbon steel, this classic helmet is great for display or wearing. Don it for plays, cosplay, LARPing, Renaissance / Medieval fairs, Halloween / party costumes and more. Expertly handcrafted in the old world style, it's straight out of Crusades-era Europe! Received a large sized helmet. Very pleased with the quality, weight and craftsmanship! I love the arms and weapons of the Crusades, and this helmet is one of my best pieces. It looks awesome. If you want it for display, buy it with no fears. On the other hand, if you want to wear it, It's enormous, so I am constantly afraid it's going to fall off. Also there is no head protection inside, just metal. Consider buying some head padding, and a chain mail coif. Overall I'm more than satisfied. Thanks BUDK! This helmet is very big but very awesome. I love this helmet and would get it again. Came covered in oil so needs a lot of cleaning and polishing. Absolutely no padding on the inside, just bare metal. Does not include the cushioning cloth arming cap in the description. When i put it on the eyeholes are a little low, i need to find padding for cushioning and so i can see properly. Comes down pretty far and covers the neck. It is perfect for display and I am trying to find some padding so I can wear it. WORTH IT!!! even though the helmet I got was different then the one in the picture. (i'm sure its updated by now) its awesome! it is heavy and big, but I would have it no other way. when I called and alerted Trueswords that the helmet had "changed" they asked if I wanted a refund. I did not, but I still appreciate there customer service. This helmet is magnificent. Great, strong metal. The brass fittings add color to the helmet. One concern, helmet is not the same as in the picture!If you look at the breathing slots in the picture, they are rectangles. Mine are circles, and at the very top of the helmet there are wavy-line-things. Mine does not have that. Another little issue is inside the helmet is BARE metal. I just put a piece of foam and a t-shirt in there and it is fine. Lastly, in the picture from the side you can see the face of the helmet comes down much lower than the neck, but mine has a lower neck, than it curves up to fit right over the shoulders and then forms the face. I actually like my helmet better than the one pictured, but I thought I should point this out to anyone wanting to buy this product. I HIGHLY recommend this to ANYONE interested in the medieval era. If you want to look even more medieval, I recommend the chainmail coif to wear under the helmet, it looks really cool. I LOVE this helmet and it is my favorite piece of property I own. This helmet is awesome 5 stars easy. Don't be fooled by the 11*8 size description they right up their, for mine was more like 15*9. And the product was of excellent quality. Thank you Legends Of Steel and thank you Budk.